Manila residents watched the city’s streets “clear out” as authorities ramped security ahead of this week’s Asia-Pacific Economic Cooperation leaders’ summit. 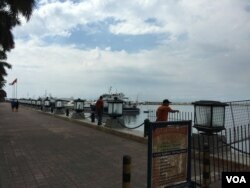 At a public park along Manila Bay and just blocks from the main meeting venue, Cesar Maglaya was not fishing like he has been doing for the past 18 years. He said police told everyone who fishes at the bay they had until 6 pm Sunday night to leave. “It hurts because it will be for one week. Government should have a care that ‘Oh, the little fisher folk will be out of work for a week,’” said Maglaya. But Maglaya said this part of the bay looked “nice and clean” without all the fisher folk milling around. His companion, a street vendor who was also told to move, said he was glad to take a break for a few days. Both men said they would not stay away for more than a week. Over the next four days Manila is hosting hundreds of business chiefs and leaders of 21 economies along the Asia-Pacific region including 17 heads of state from countries such as the United States, China and Australia who will be attending the summit. A statement released Monday from New York-based Human Rights Watch said the marginalized in the metro Manila area were rounded up and sent to homeless shelters in the days leading up to this week. The international human rights advocacy group said some 140 homeless children were arrested and people complained of being man-handled and forcibly moved offsite. But the spokesman of the Philippine National Police said the national agency does not arrest children. Spokesman Wilben Mayor said police make sure homeless children and the needy are getting help from the country’s social services department, especially during times when major events take over the streets. He also said there was no reason to “hide” the city’s poor because the member economies of APEC know the economic “state of the country,” where more than one quarter of its 100 million people are poor. Ferdinand Collao, who lives and works just outside the metro area, said he was excited about APEC taking place in the city. He said he thinks the country is ready for contingencies, more so after the Paris attacks Friday night. “Especially the officers here in metro Manila. I think they are all prepared to tackle any security issues that may arise during this one-week summit. I think we are all preparing not only the government but all of us here are prepared for that,” said Collao. Tuesday through Friday are holidays for students and government workers and Wednesday and Thursday, when the heads of state meet, will be days off for private sector employees. Others were more worried about the traffic situation. 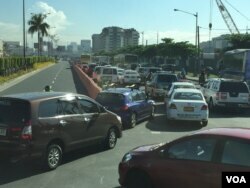 There are unusually long waits during rush hour at gridlocked major thoroughfares that have dedicated “APEC lanes” for heads of state and delegates. Manila small business owner Tom Santos said he hoped the city would show its good side to help facilitate the arrivals of all the heads of state. Police spokesman Mayor said authorities have been encouraging those with days off to go home to their provinces and visit family. For those left behind, they have asked residents to stay home and if they really have to leave, to have a little patience.